Tuesday night Mike surprised me with tickets to the New York City Ballet. It was a trio of shorts: Swan Lake, Allegro Brillante, and Tchaikovsky Suite no. 3. All three were beautiful, though we agreed that Swan Lake was the best, followed by the Tchaikovsky. Every time I go to a ballet I tell myself I should do it more often, though I think our current frequency is enough for Mike. 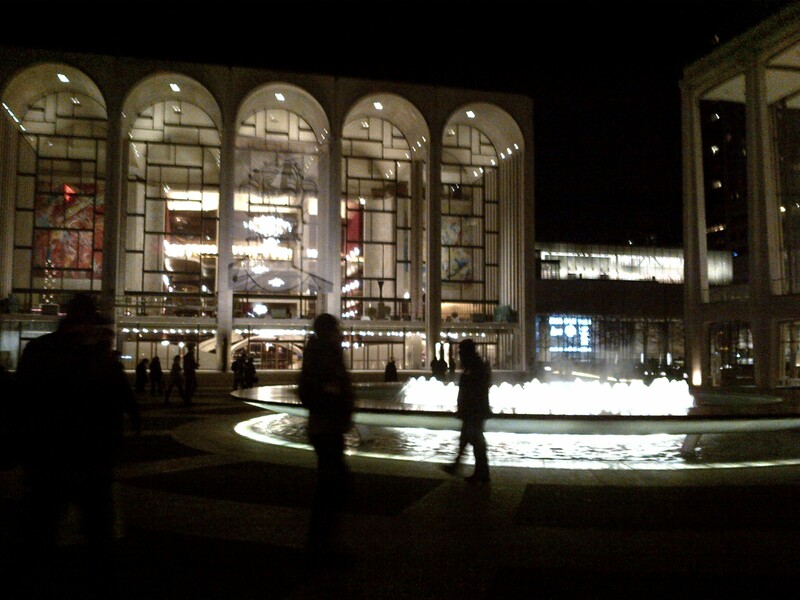 It was a wonderfully romantic evening set in one of my all-time favorite NYC spots: Lincoln Center. Day or night, summer or winter, I am always taken by the sight of the fountain, the theaters, the gigantic arched windows framing the Chagall murals. It is my favorite place to glimpse from the back seat of a late-night taxi and the most grand place to take in culture in New York. At the same time it is so familiar, just blocks from my office and a place I pass regularly, near the home of some favorite childhood-in-NYC memories. New Yorkers, what are your favorite famous NYC landmarks?